When SAE International released its “SAE TIR J2954 Wireless Power Transfer for Light-Duty Plug-In/ Electric Vehicles and Alignment Methodology” last May, we had hoped that wireless charging standards would be quickly adopted, but it seems there is still couple more years to “make it so”. According to Green Car Congress, charging level WPT 2 (or 7.7 kW) is to be approved in January (along 3.7 kW WPT 1), but commercialization is not planned to be at full swing until 2020. “In a program track on Charging Infrastructure at the World of Energy Solutions Conference in Stuttgart, Germany this week, Jesse Schneider (BMW), SAE Taskforce Chair, Wireless Power Transfer and Alignment Methodology, presented the recently published SAE TIR, Wireless Power Transfer (WPT) for Light-Duty Plug-In/ Electric Vehicles and Alignment Methodology (earlier post) along with plans for standardization by 2018 to support commercialization. The SAE TIR J2954 contains a normative specification for both the vehicle and infrastructure side coils for the power level WPT 1 up to 3.7kW and informative specifications for WPT 2 to 7.7kW. Tests of various systems (WPT 1 and WPT 2) are underway at Idaho National Lab (INL) with interoperability between them as main topic. The higher power 11 kW WPT 3 and 22 kW WPT 4 still awaits its turn. 36 Comments on "7.7 kW Wireless Charging Standard Expected To Be Adopted By January 2017"
Good, but by 2020 I’ll probably be DCFC fast charging at home. Yeah, by then most other EV’s will probably be at L2 10KW charge rate for home. Tesla already is and whatever other products that use Tesla battery stuff. Why would any normal home require 10kW charging? Why even 7kW for that matter when the *average* car only uses ~10kWh of electricity *per DAY*? Why would anyone put fire extinguishing sprinklers when on average they are used zero times a day? Because, when there is a fire, you better have them ready. Why would any normal home require 10kW charging? Because, when you need to travel 200 miles the next day, your ev better be ready. Unless you’re driving 200 miles every single day, you don’t need 10 kW. If your daily drive is under 40 miles a day, even 1kW 120V L1 would be allow 200 miles ready each morning. If your daily drive is under 100 miles a day, 3.3kW L2 would be fine for 200 miles ready. If you drive 200 miles a day, 6.6kW L2 would be fine, but I suggest you move closer to where you go instead of driving so much each day. Well, there are not many people that, on a whole year, never do 200 miles two days on row. If you come home late at night with a flat 100 kWh battery in your EV and need a fully charged car ready to go in the morning. There’s 400V AC (3-phase), 22 kW home chargers in Europe. That’s not too much, even though you might not always need this much power, but sometimes you do. Nah, not DC fast-charging unless you are prepared to pay to upgrade your home’s electrical main box, perhaps pay the utility for a bigger wire to your house, and likely pay high “demand charges” to the utility. But it really isn’t needed or worth it. Overnight charging is fine. In fact I think an important feature that EVs will need in the future is a programmable system that limits how fast it charges in order to avoid demand charges. Not true. 100amp panels are minimum for most houses, and 200amp panels are the rule for most newer houses. For comparision, 30amps is a standard L2 charger. In Europe the 400 V triphase+neutral makes it somewhat easier to have a higher power. If you want 10 KW or 20 KW for one or two ev and about the same for the house itself you have enough with 50 A 400V triphase+neutral, no need for 200 A. 400 V will also reduce the line loses and demand 30% less copper. For once, that is a true European advantage. You’re going to pay for a 50kW or better electrical hookup for your home? Unless you have a heck of a lot more dollars than sense, then no, you’re not. Installing a L2 charger where you park your car makes sense. Upgrading your home’s electrical wiring to provide an industrial-strength power feed for DC fast charging a PEV… does not. L2 charging will be the standard for slow charging at home or work. Only the very rich will be paying for DCFC at home, and quite possibly not even very many of them. Why is the SAE chronically behind EV Charging Standards approvals??? We’re talking YEARS of lag here. It would be nice if they were faster but I don’t think this one is all that important. I just wish they were much faster with CCS. That’s the really important one. And the J1772 for L2 charging is decent. That’s whay Tesla had to do its own standard. They will probably do the same with wireless. Tesla won’t waist any time on them this time around. And the other EVs manufacturers either. If you protect the bottom of your car with a titanium shield, how much will it degrade the efficiency? That’s not even a factor. 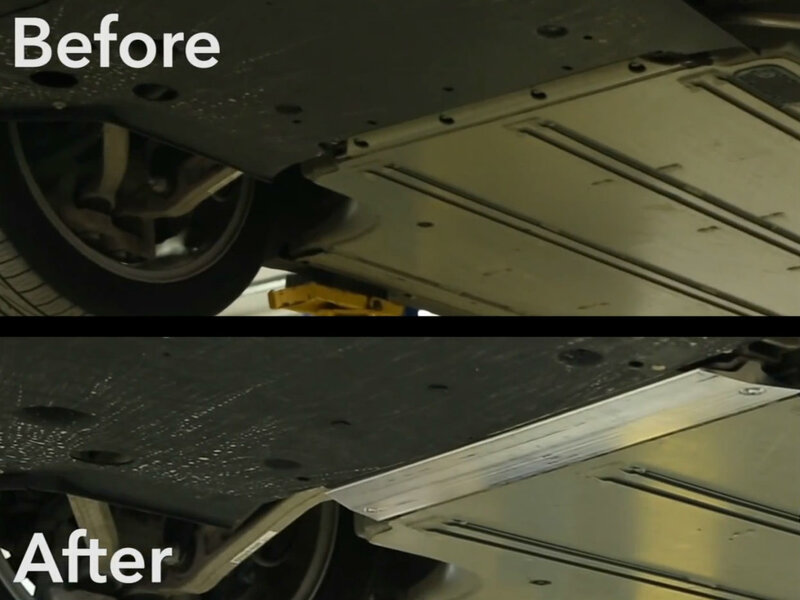 What Tesla is calling a “titanium shield” is a strip of metal running across the bottom of the car; a strip that’s only something like 3-4 inches wide. Tesla is currently* opposed to put wireless charging into its cars. I feel confident that will change in the future, but don’t expect to find a wireless charger as an option from Tesla anytime soon. So if you want such a system, it will have to be installed by an aftermarket/customizer shop. Assuming they do the job correctly, they will modify it in such a way that the pickup coil won’t be blocked by any existing metal plate. There is also a huge aluminum shield across the whole thing. Presumably the charger would have to go in danger’s way and be able to take debris hits. I also don’t see the benefit of a home wireless charger. The installation would cost more as well as the equipment. Also the efficiency has to be lower. More of the worlds energy sources wasted because people are to lazy to plug in their car. Fewer people will be killed or disabled due to tripping on cords. Dynamic charging is next (charging while in motion). Like TV remotes or remote controlled garage doors. More of the worlds energy sources wasted because people want a pretty car. People like convenience and comfort, changing the human nature never worked out well, try to work with it. Oh, why stop there? Why not go on a rant about washing machines, clothes dryers, central vacuum cleaners, and dishwashers? Or in fact people using motor vehicles for transportation instead of bicycling or walking? Shaking your finger at people and telling them they “ought to” impoverish themselves for the good of the planet, only gets people ticked off at you. Unless we all agree to start living as primitive hunter-gatherers, then the right approach is to advocate a strong public campaign for birth control, tightened pollution limits, and replacing the use of fossil fuels with renewable energy. So far most of the energy isn’t renewable and it isn’t going change overnight. Or even any time soon if you think about mining and industrial processes for a second. Advocating for $100k electron guzzlers is just that, alternative way to trash environment by pushing society to compete who has heavier, bigger and better performing (=dirtier) car/SUV/truck. Plug or not plug, the end result is the similar. Even with wireless charging, PEVs are gonna be about 3-4 times as energy efficient — and less polluting, on a well-to-wheel basis — than cars powered by compressed hydrogen. Trying to make people think something much better is the same as what we have now is a traditional strategy of those that want to keep the fossil status quo. Because EVs use WAY more power than any of those combined, it doesn’t make sense to waste 12% efficiency just because people can’t plug in a cable. As a huge EV proponent and owner, I’m appalled at the suggestion of anyone using this for regular charging duty just to save a few seconds when it’s so incredibly wasteful. Surprisingly using a dishwasher is more environmentally friendly than doing the dishes by hand. A study has shown people washing by hand uses a lot more water than a modern dishwasher does and many people overdose soap too when washing by hand. When u harvest renewable energy, then efficiency and loss become irrelevant. We are not there yet, but it won’t take long before we get 99% renewable. I expect the wireless charging standard to be adopted much faster than combo charging, now that there is already an established and thriving market for EVs, and the luxury market will be huge. With that, luxury consumers will be expecting wireless charging, especially at home, so there is no forgetting to charge, the car is just charged every time it’s parked. Same benefit for non-luxury consumers as well. The 7.7kW speed should be fine also, since the car will in most cases be parked for 8-10 hours every night, and during the day, most consumers won’t get close to using all of the 300+ miles of range available in the battery pack. In addition, wireless will be critical for autonomous car-sharing, and also considerably reduces the cost of installing charging infrastructure for people who don’t live in detached single-family homes with dedicated parking/charging. Installing curbside chargers at every parking spot would be a massive undertaking that would take many decades, and is the most expensive type of installation by far. By contrast, given autonomous cars and wireless charging, you only need to install chargers in publicly-accessible parking garages and lots along with a much more limited number of curbside spaces, as the cars can move themselves once they’re charged. Although the overall energy efficiency is lower due to dead-head travel and lower charging inefficiency, the cost and time benefits of using autonomous cars with wireless charging are huge, making PEV use by most of the world’s urban population possible at a much earlier date than would otherwise be the case. Fewer chargers will be needed because fewer urban residents will need to own cars. As to the relative costs, while a post or wall mount is cheaper to install, you also have to factor in the costs of damage and vandalism requiring replacement. A buried coil is basically immune to that. What is Tesla using for their shore to shore autonomous demo next year? The snake? They haven’t said. Hopefully the autonomous car won’t need to be followed by a support vehicle carrying people who plug it in at Supercharger locations. Insane – Isn’t wireless charging efficiency at this point at a 12% loss vs a cable, at BEST? Seems massively wasteful and will be a very very bad idea if mass adoption of EVs is to become the norm. Imagine how many megawatts would be wasted each year going to wireless if 100 million EVs were on the road and charging every night. The Tesla auto-snake thing is a way better idea, even if its implementation is early and ugly at this point. Some sort of auto-retract cable would reduce the potential fossil fuel usage by 12% over a country! As stated above the only path for autonomous electric vehicles are with wireless charging.